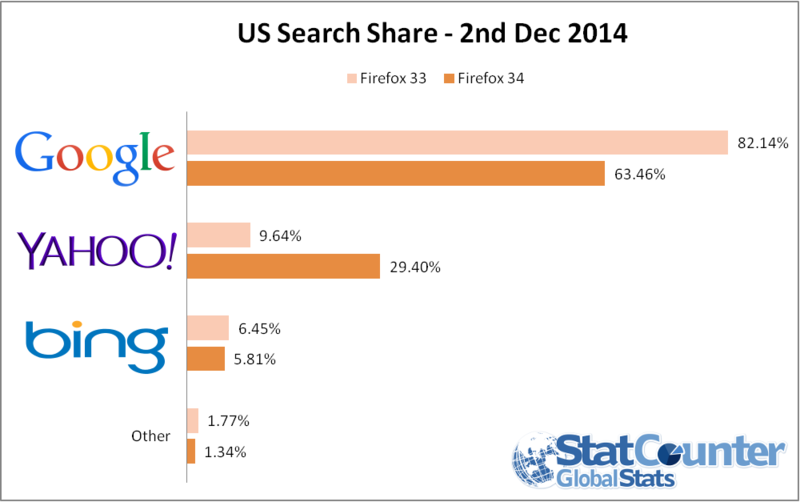 San Francisco, CA & Dublin, Ireland; Monday 3rd December 2014: On the 2nd December in the US, Yahoo search was used 3 times more on Firefox 34 than on Firefox 33, according to StatCounter, the independent website analytics company. As previously announced by Yahoo, this month marks the start of its partnership with Mozilla. Yahoo is now the default search experience for Firefox 34 in the US, replacing Mozilla's 10 year relationship with Google. A special report from StatCounter Global Stats finds that Yahoo usage on Firefox 34 in the US on the 2nd December was 29.4% compared to 9.6% for the previous version Firefox 33. Google search usage by Firefox users dropped from 82.1% to 63.5% as they upgraded from version 33 to 34. Bing declined slightly from 6.5% on Firefox 33 to 5.8% on Firefox 34. "Firefox 34 is still being rolled out so its usage is currently quite low. It will be interesting to see how this develops," commented Aodhan Cullen, CEO, StatCounter. "At the moment the change is having a negligible impact on overall search share in the US, but if this early usage trend on Firefox 34 continues then Yahoo could be on course to gain a number of percentage points." On the 2nd December overall search share across all browsers in the US was 78% for Google, 12.4% for Bing and 7.9% for Yahoo. StatCounter (www.statcounter.com) provides independent website analytics, including a free option, to companies, agencies, bloggers, self-employed, charities and those who want to measure activity on their website, blog or forum. Key features include ease of use, independence and ability to view individual visitors in real time. StatCounter recently announced a new feature in response to Google's removal of keyword data. By integrating Google Webmaster Tools (GWT) data into its reports, StatCounter has given its members the ability to access all available keyword intelligence which they can slice and dice all within their StatCounter account.